When our children move onto Secondary school from Primary they begin to learn more about the world and its many facets through the medium of language. 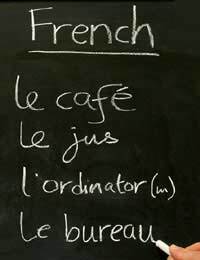 One of the most popular languages taught at secondary school is French. French can be taught in a variety of different ways using verbal discussion, worksheets and listening to audio conversations in groups and then having to identify the key words used. Children in French classes also use a French dictionary to help them pinpoint key words and phrases as they learn. What is Key Stage Three? Key Stage 3 is the name given to those modules of learning that a child will undergo at school from the ages of 11 to 14. Fundamentally this stage is a forerunner to all that is required to successfully complete and pass GCSE level studies later on in their secondary education. Key stage 3 covers years seven through to nine. During this time your child may wish to learn French or indeed it may be taught as a compulsory part of their curriculum of learning. What is French Key Stage 3? These are the fundamentals of most languages but they are especially important if the language you are learning is not your first language. The French languages consists of many different permutations for the same thing – or similar things – so it is important to ensure that where possible children have as broad a base of learning as is possible. Again these are the fundamentals of any language and are as we have already touched upon as important in French as in any language because of the variety of different meanings and phrases for similar things. Outside of the United Kingdom France is the closest country to us and the one which many people visit either on holiday or for means of business and subsequent relocation. French is also a language that has found its way into the locales of a variety of countries through the world including Canada which has a considerable French speaking population as well as Switzerland whose banking community also has a large French speaking contingent. French is taught because there is a greater chance that your children will either speak to or need to speak to members of the French speaking global community than there is for them to speak to any other foreign speaking individual. Also it is highly regarded that the French and British cultures are very similar in many regards and just as the French learn to speak English we learn to speak French in order to communicate with a larger number of the European and global communities.